Here we are already Friday, and almost done with the series! Only two more days to go after today, and things will be back to normal around here:) I've really had fun with the hair overload though, and I hope you have too! I've sent out calls for requests before, and today is another frequently asked for style, the 'Kim Kardashian' Ponytail! What I love most about this style is how elegant and chic one can look, while spending mere minutes on their hair. This style doesn't need a large amount of instruction, but there are several key tips and tricks that will help perfect the style, while certainly makeing it easier and faster for everyone. Here we go! 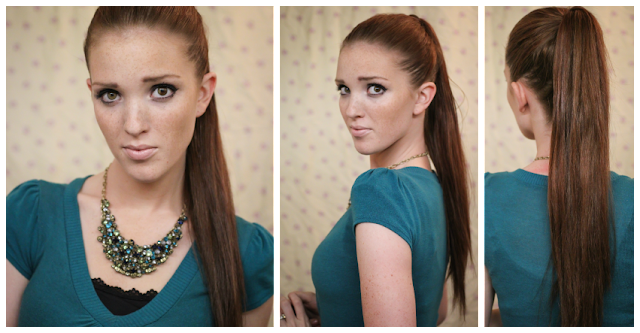 Step 1: Begin by brushing and smoothing all your hair back into a high ponytail. Be sure and brush every bit of your hair around your head as you gather it together, to ensure your ponytail is as smooth and tight as possible before tying it tightly with a hair-tie. Step 2: next you're going to want to get rid of those flyaways by using your fine-toothed comb around your hairline. if you have curly or wavy hair then you'll want to begin flat-ironing your pony by starting one 1" section at a time. Once through brush your ponytail together and smooth a little serum over your scalp to keep it straight and shinny. Step 3: Next you'll want to take a 1" section of hair and wrap it around and around the hairtie, securing it under the base with a bobbypin. Apply a touch more serum, this time to the ponytail itself. rubbing your hands together and then running them down the pony to coat the outside. Spray qith a little hairspray for forever-lasting hold, and you're done! Love the sleek look! This is one of my favorites of your hair tutorials! aw thanks so much lady! I realized I've not really posted something like this for a long time! Thanks so much for all your comments aswell Carlee, You always make me smile! Love the Slick pony! And great tutorial - will be coming back when I need to do this kind of pony!! You have a really lovely hair! aw thanks girl! I'm so glad to have you as a follower! THanks for the feedback too, I try to always make things very clear and straightforward. It brings out your features a lot, beautiful! xoxo. I love this. Very chic and simple style that always looks amazing! Have a great weekend pretty girl. This looks fantastic. So sleek and polished. I love the idea of this sleek ponytail, it polishes off any look and makes your outfit look more expensive and sophisticated! It's neat and super simple to do as well. Thanks for the lovely post, dear! You are amazing, I love this hairstyle! That's so great! Yesterday I searched for such tutorial! Your hair is so gorgeous. Have a good weekend. I love this pony! What kind of smoothing serum do you use? I own zilch hair products, so I'm a bit clueless!